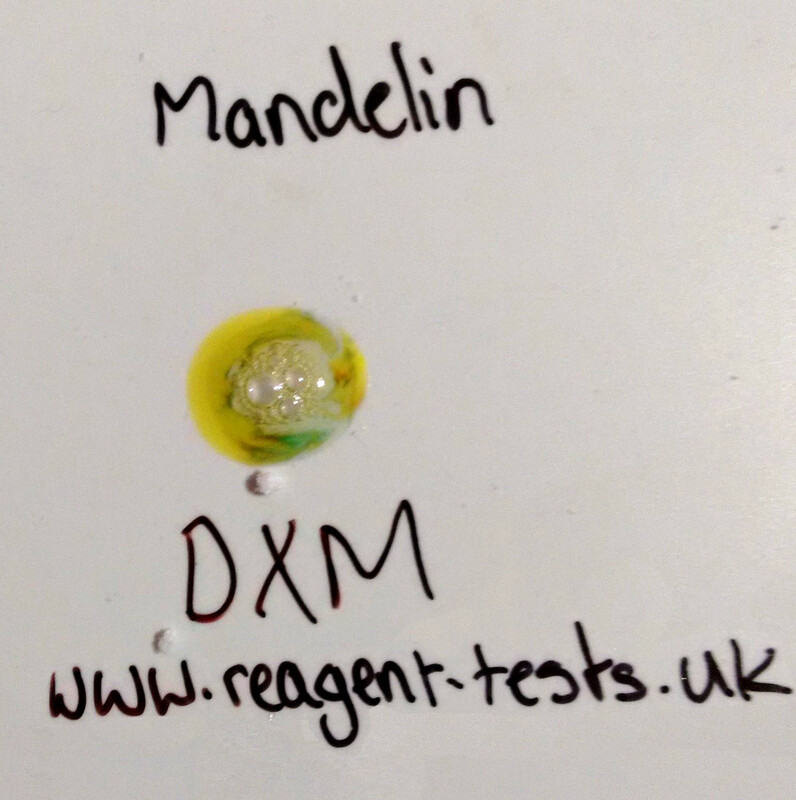 Edit: We have also detected purple and pink Heisenberg pills with pentylone in them. Avoiding this press completely is recommended. 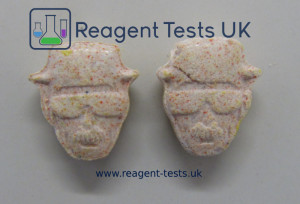 The beige Heisenberg tablets currently available contain NO MDMA but instead contain pentylone, a synthetic cathinone stimulant. 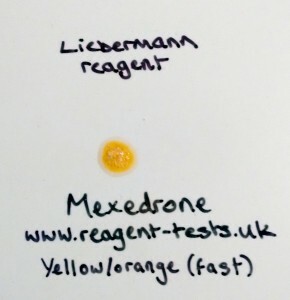 The pills will react bright yellow with the marquis reagent, whereas MDMA goes black so these ones are easy to spot as rubbish. Pentylone is slightly like mephedrone but lasts longer and is much less enjoyable. 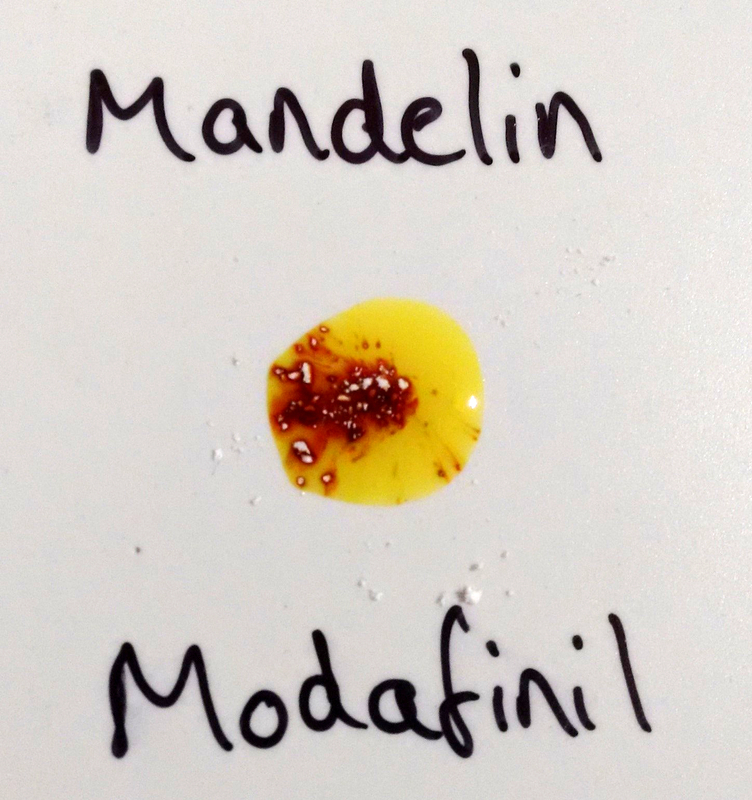 Because it is less enjoyable but does have an effect, people tend to think they just have weak pills and need to take more to get the buzz they want. This results in a very high dose of pentylone, which prevents sleep for hours after it wears off, and along with its stimulant effects can cause paranoia and psychosis, as well as totally ruining your night. 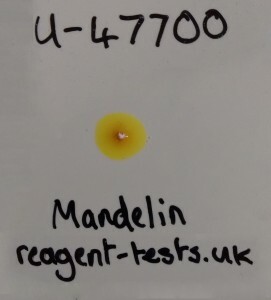 Pentylone is class B in the UK. For the second time in two weeks, Manchester police have issued a warning about high strength MDMA pills circulating in manchester after two women in their twenties collapsed early on Saturday morning. 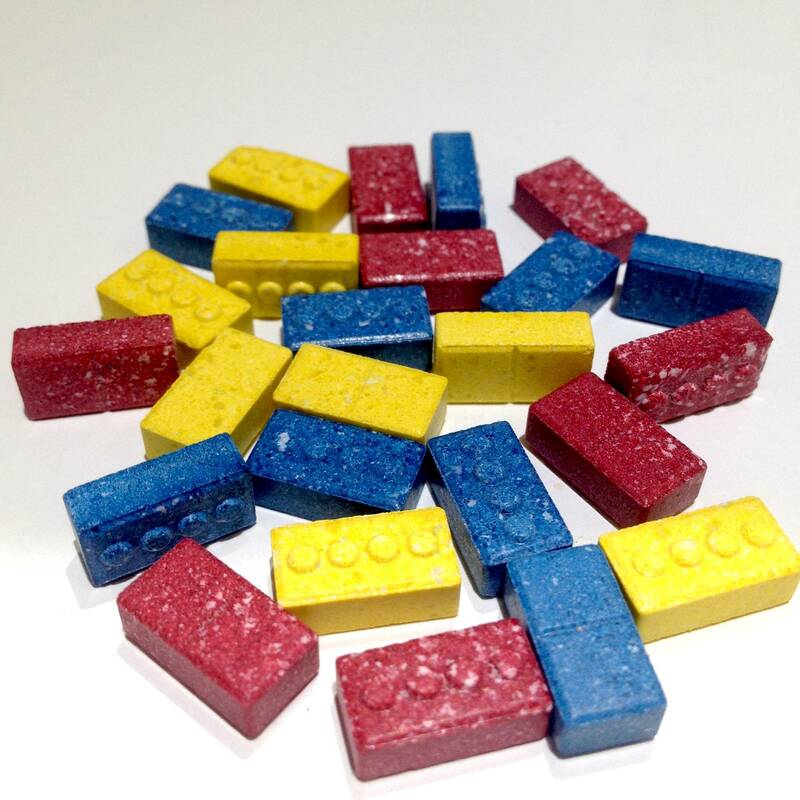 The police say the pills concerned are the “lego brick” tablets and posted the photo on the left. Sadly this is another low quality image which appears to have come from social media! 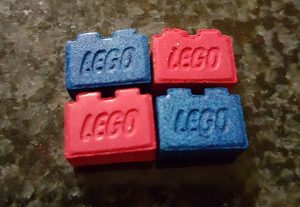 There are currently two DIFFERENT types of lego brick pill on the market so this is a bit of a problem, and the police have not released any analysis of what’s in the pills. With that said, both variations of the pill are professionally pressed, and likely to be very strong. 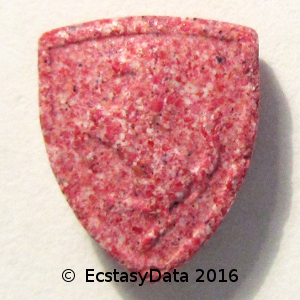 In addition to this, both types are quite new, with the “other” press (pictured below) being listed as over 200mg of MDMA. 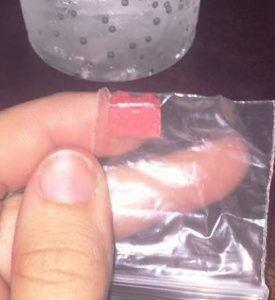 Again, this is extremely strong, with a typical dose of MDMA being 130mg. Use the #CrushDabWait technique to avoid a strong pill or powder taking you by surprise. Know your dose – if you aren’t using #CrushDabWait, make sure you know how much is in the pill, or how much powder you are taking. Scales are cheap, brains are not! Avoid taking other drugs at the same time – this can really complicate things and make it hard to know how much is too much. This includes alcohol – keep it to a couple of drinks. Hydrate sensibly – take sips of cold water, drink a sensible amount for the activity you are doing. 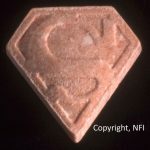 MDMA makes you feel constantly thirsty but stops you peeing, so you can “dilute” your blood dangerously. Stay with your friends – they know you, and if you’re looking in a bad way they’ll be able to sort you out and keep you safe. Don’t be afraid to ask for help – the medics are not the police, will not call the police and are usually incredibly friendly. No matter what, they WILL keep you safe. CheckIt! 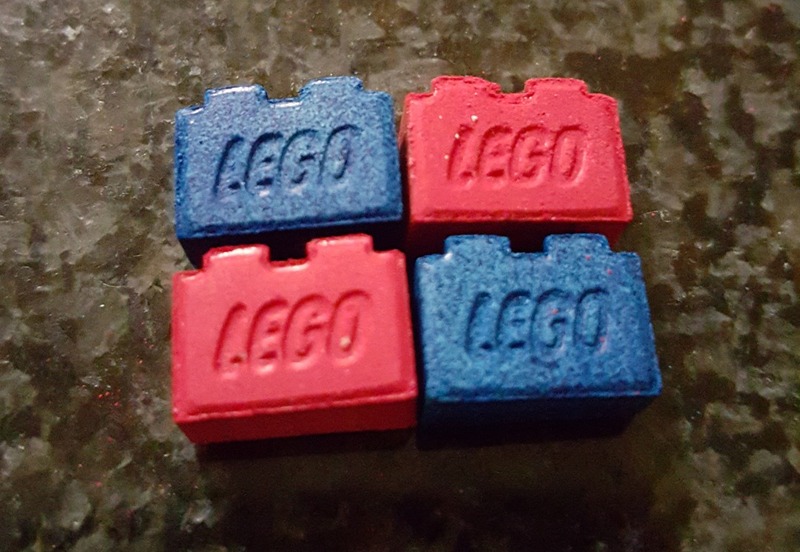 result for possibly related two-notch lego pill. 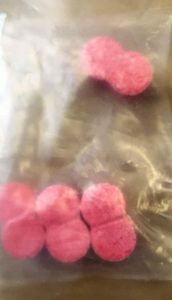 Following the death of a 17 year-old girl in manchester at the weekend, Greater Manchester Police have issued a warning about the “Mastercard” ecstasy believed to be responsible. They have accompanied this with a photo of the affected batch, which do appear to show the popular pills. Accompanied is a professional image from pillreports.net for comparison. 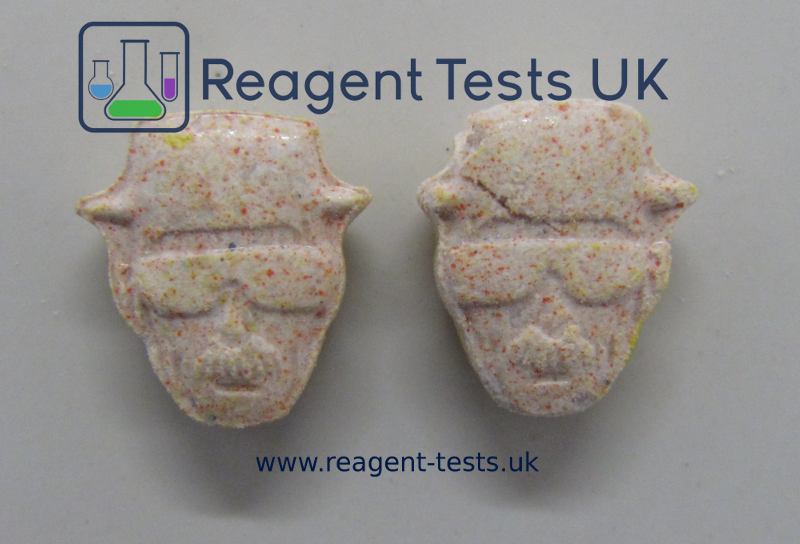 These have been analysed by several organisations who report that they contain around 200mg1 of MDMA. 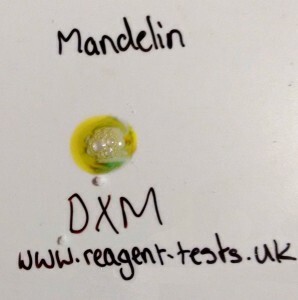 A typical single-dose of MDMA for a teenage girl would be under 100mg, which makes these a really strong pill. The police do not comment further on the matter but it seems likely that this is a tragic case of overdose from the extreme strength of the pills, most likely compounded in a hot environment. You can buy an MDMA test kit here to help inform you about pills and powders, but please always remember to use the #CrushDabWait method when using a new batch, even if you have already tested them. Knowing they are strong or contain something dangerous doesn’t help if people still drop 5 at once! Police have urged anyone who has taken the pills to seek medical attention, even if they are not under the effects of the drug. This is quite uncommon given that very few drugs can cause fatalities after the effects have worn off, but they have not elaborated on the reason for this advice. 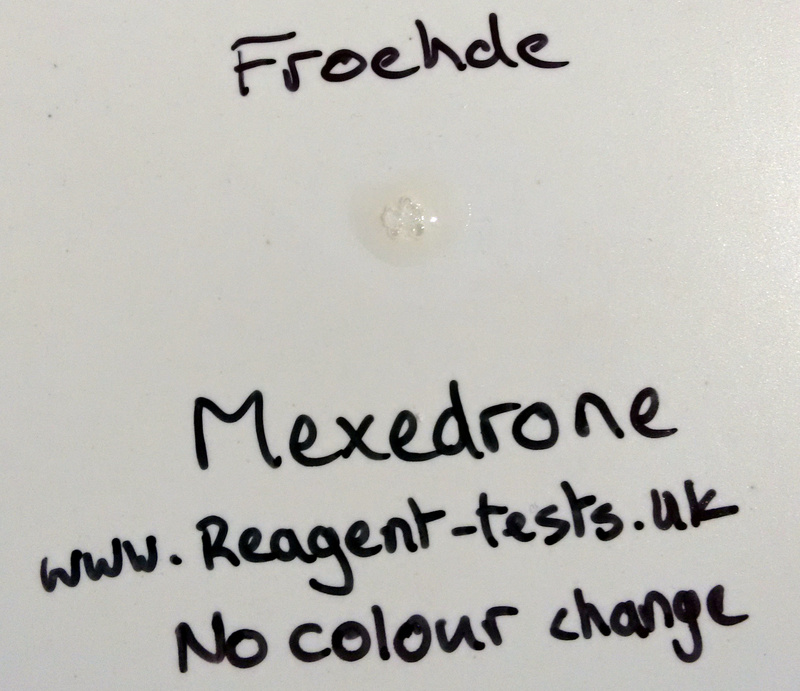 Mexedrone is the only cathinone currently sold legally in the UK. It strays significantly from the traditional structure by having an ether group in the alpha position, which makes it legal and brings the dose to be the same as mephedrone. It is still a stimulant drug, and does seem to have collected some limited popularity among enthusiasts. 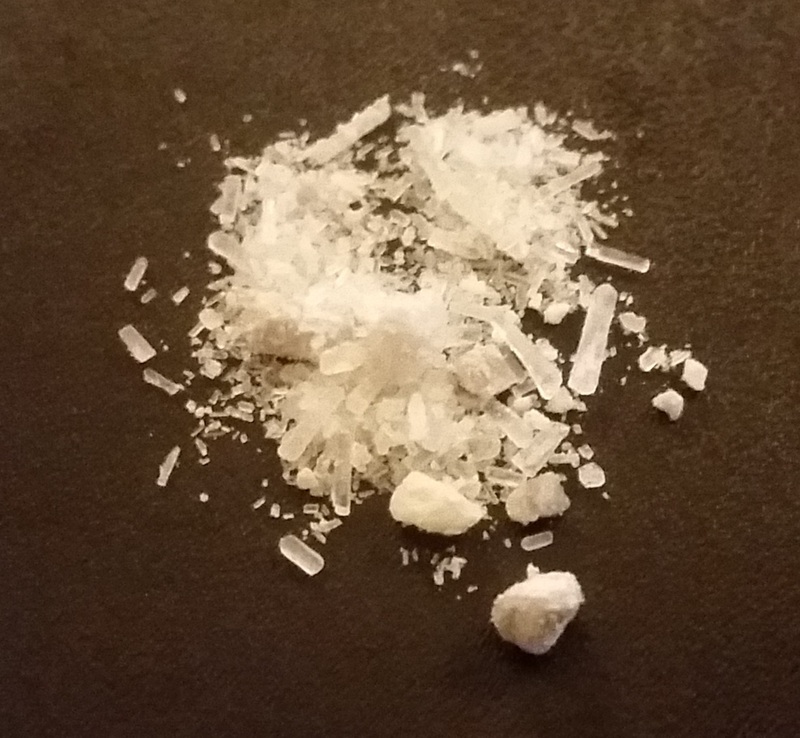 It takes the form of some quite attractive white/colourless crystals. 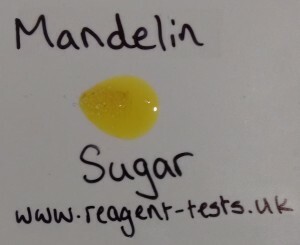 The reagent test kit results are as follows, with the marquis test first, showing fizzing but no colour change. 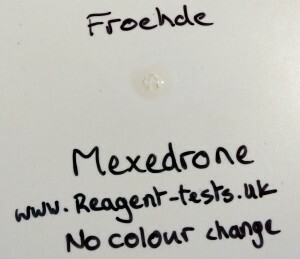 The froehde reagent test gives the same reaction with mexedrone – no colour change. 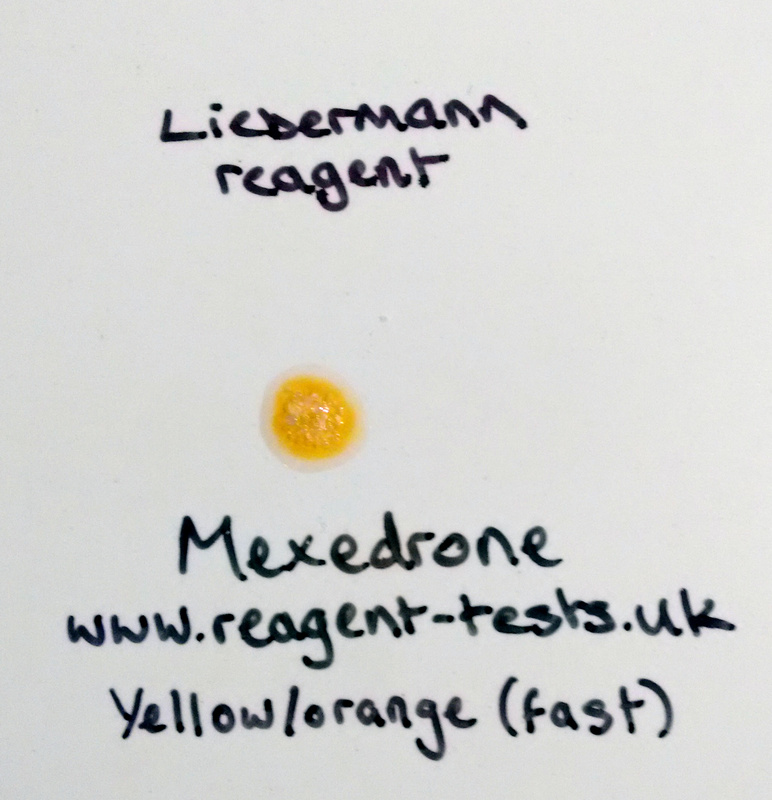 Yet again the liebermann reagent pulls through, giving a bright yellow/orange reaction. 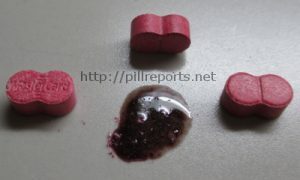 Dibutylone is a novel cathinone stimulant which appears to be sold as MDMA and mephedrone since butylone has been banned. Based on similar compounds it is likely that it will behave as an “extended release” version of butylone, and be inactive until it passes through the liver. This would make snorting mostly ineffective. The Daily Star is reporting that “Chupa Chups” stamped ecstasy tablets with PMA are circulating in the UK. 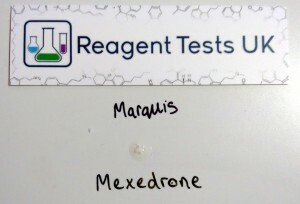 An anonymous source is reported to have sent the tip-off claiming the pink tablets are stamped with the brand name. 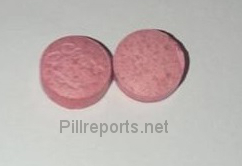 Though red Chupa Chups tablets have been circulating for some time, a recent round, pink chupa chup pill has also recently surfaced and has had a questionable reputation from the get-go. 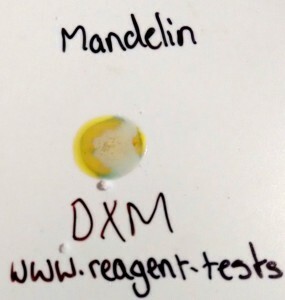 Pictured below, courtesy of pillreports.net, the submitter suspects the contents are MDxx + PMA/PMMA. 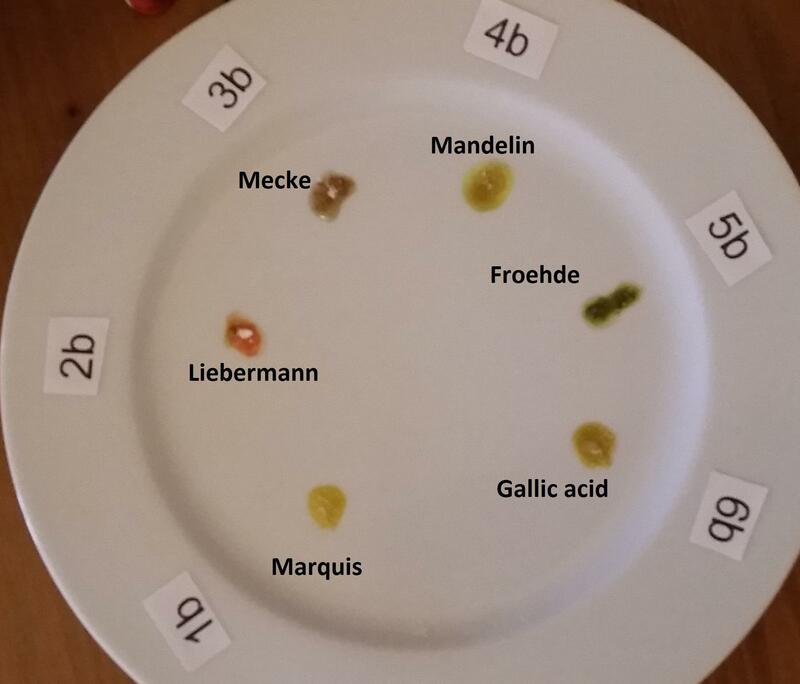 An image of the suspected PMA containing pills. The more popular red Chupa Chups pills have contained MDMA for some time and have a “flower” style outline with a stylised Chupa Chups logo. 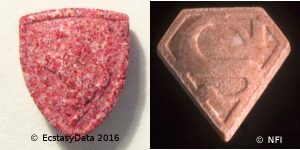 Users are being urged to exercise extra caution until more information is known – uncorroborated tabloid rumors can turn out to be just that, but for the cost of a few pills it might be worth picking up an MDMA testing kit just in case, regardless of the pill logo. If you do find yourself taking a pill without testing it first, remember to #CrushDabWait – this will reduce the risks no matter what’s in it, be it strong MDMA or PMA. 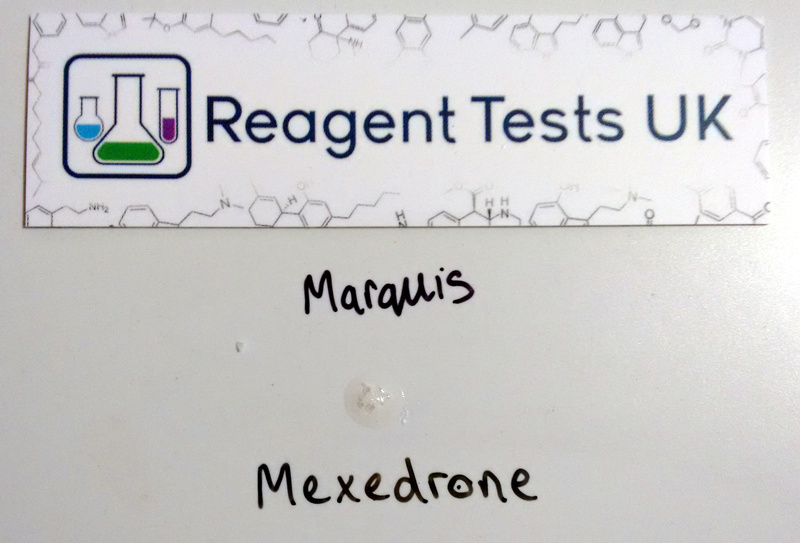 None of these compounds had results available so we thought we’d test them so that future researchers would be able to screen for them. 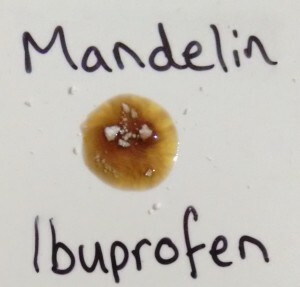 Ibuprofen is of particular note because its easy availability makes it good for testing the reagents themselves to ensure they are still working well. DXM is an interesting one here, it very quickly reacts (as with most reagents) giving a green colour which progressed to blue within 15 seconds. The second photo is at 60s and shows the colour progression to clear in the middle with a blue tint at the edges. Ibuprofen goes a muddy brown colour pretty quickly and then stays that way. Beautiful. 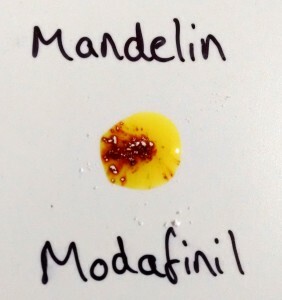 Modafinil gives the same deep brownish red that is seen with some of the other reagents when reacting with the mandelin reagent. 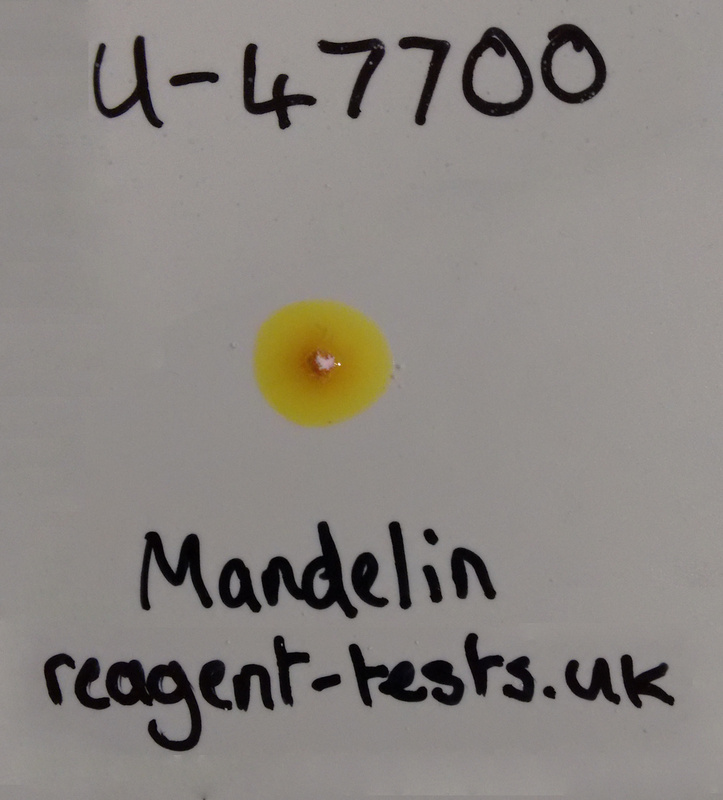 We previously tested U-47700 as it was becoming popular and since we’ve added new reagents to our offerings while its popularity has continued to rise we decided it was worth testing again. 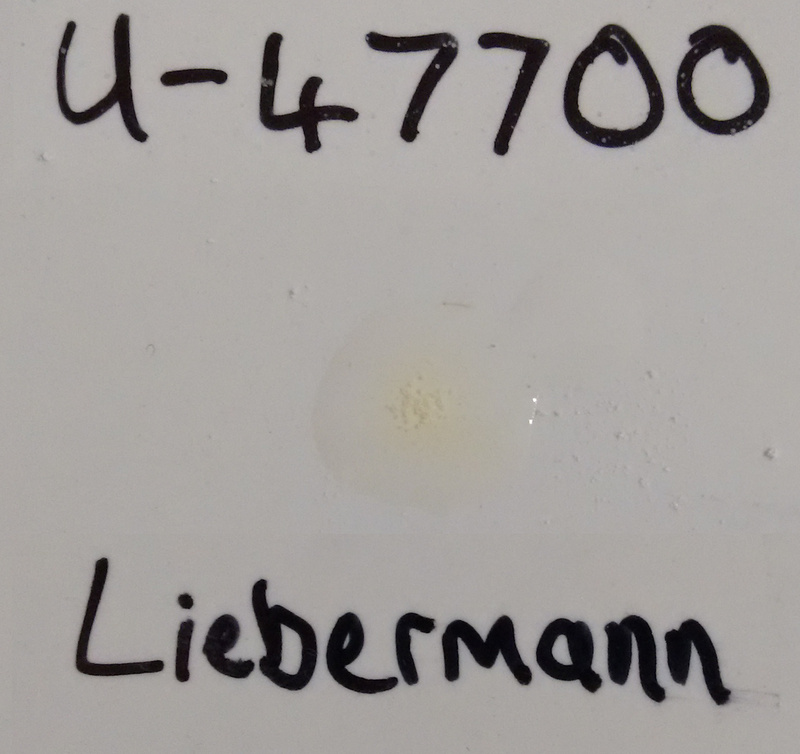 You can see the original test results here but the summary is that there was no colour change. 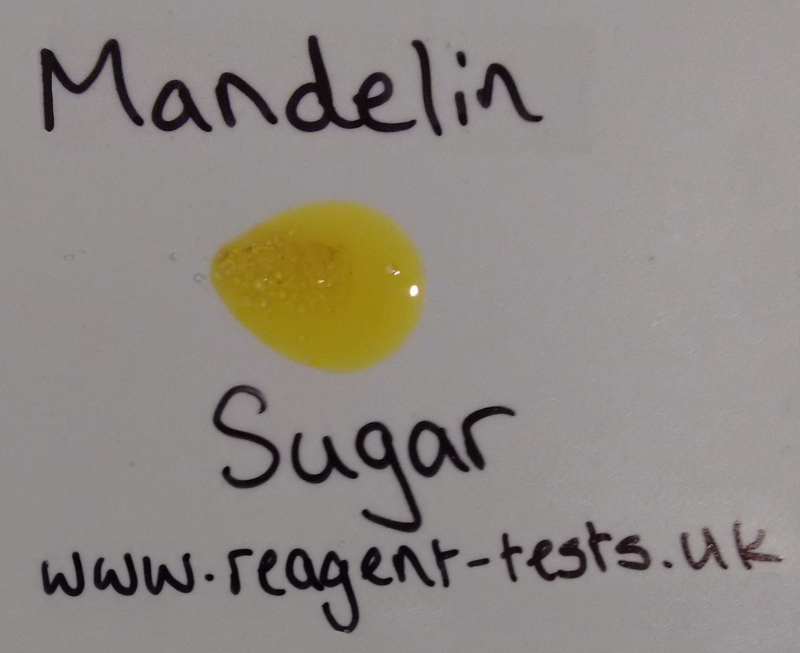 The liebermann and mandelin results were only fractionally more exciting.